Welcome to M & R Insulation Systems LLC online. 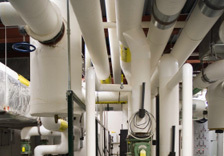 M & R Insulation Systems is a mechanical insulation contractor with over 75 years of combined experience in commercial and industrial piping and ventilation systems insulation. Recognized for our ability to adapt to almost any system requirements no matter the obstacles posed or the scope of the job, our team has gained a reputation for dependability and innovation in the mechanical insulation industry. M & R Insulation is a proud member of Associated Builders and Contractors (ABC). Learn more about the experienced leadership of M & R Insulation, the source of our company's success as an industrial and commercial insulation contractor for over three generations. Visit our About Us section, or call us directly at 800-693-9650 to speak with a mechanical insulation specialist. Contact M & R Insulation Systems to request information on insulating your building's pipes and air ducts to improve and maintain mechanical systems performance.